"This traditional Mexican rompope recipe is made with only 5 ingredients. It is easy to make and all you need is a little patience stirring the eggnog while it boils. In Mexico, people make it with either rum or brandy, but here rum is more common." Combine milk, sugar, and cinnamon sticks in a large saucepan and bring to a boil over low heat. Continue to boil mixture, stirring constantly, until milk has reduced by a little more than 1/3, about 20 minutes. Remove from heat and allow to cool. 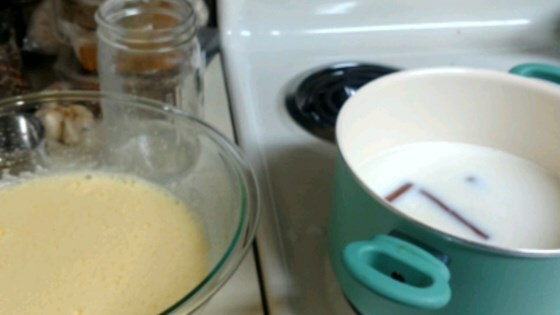 Beat egg yolks with an electric mixer until thick and pale. Mix in a little of the warm milk. Pour egg yolk mixture into the saucepan and bring to a boil over low heat. Stir constantly and scrape bottom and sides of saucepan until mixture is thick enough to coat the back of a spoon, 5 to 7 minutes. Remove from heat, fish out cinnamon sticks, and cool to lukewarm. Stir in rum and cool completely, about 2 hours. You can also use brandy instead of rum.